Special events celebrate and enhance the special relationship we share with our canine companions. If you would like to be kept informed of scheduled events, please be sure you are on our emailing list. To join the list, just go to our contact page and send us your info (which is always kept confidential). You’ve worked diligently with your dog and have a wonderful canine companion with good social skills. It’s time to put your training and your dog’s skills to the test! Here’s how to do that. Register for the test: When you register, choose the time period that works for you. There is only one evaluation per half hour period. Create a C.L.A.S.S. program Student Account at the APDT website so that your score can be posted. Read the Student Handbook for the evaluation. This handbook also contains great information about dog behavior and training. Familiarize yourself with the B.A. Test and Scoring Guidelines. C.L.A.S.S. stands for Canine Life And Social Skills. Every level of the C.L.A.S.S. program (there are 3) has a formalized evaluation you can take to test your (and your dog’s) skills. The B.A. 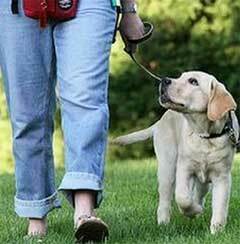 walking nicely on leash level test has some similarities to the AKC Canine Good Citizen (CGC) test (but C.L.A.S.S. is governed by the APDT, Association of Professional Dog Trainers, not the AKC.) You will also have taken the first step toward the real-life skills required to pass tests for therapy dog work or just know that you have trained a solid canine citizen. At the B.A. level, the use of treats as rewards after the completion of an exercise is allowed and encouraged. Don’t know if you are ready to take the test? Watch a video that demonstrates the B.A. level skills tested in the evaluation: Click Here to Watch. Get validation and feel proud for how hard you’ve worked and how awesome your dog is, or find out what you need to work on. 6-week class, My Dog Has C.L.A.S.S. It will prepare you and your dog for this evaluation and will teach your dog social skills to make him or her a more fun, reliable companion. Interested in testing for the M.A. level? Check out the video demonstration and then contact us to let us know and we will give you a time on the March 18th test date. This is a great opportunity to practice your agility in a different atmosphere and have some FUN with your dog. There will be two courses to challenge all levels. Do all or part of the course and practice important handling skills, whether you are at the novice level or higher. Toys and treats are allowed. NO harsh methods will be accepted. Bring your chairs, crates and water bowl for your dog (we have a hose and water fountain). Please only flat buckle collars. When you take this important class, veterinarian Dr. David Cox will teach Practice with a realistic resuci-dogyou many important skills that could help save the life of your pet in an emergency. 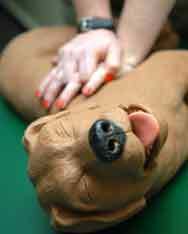 You will practice cardiopulmonary resuscitation on a life-like dog mannequin and learn to apply first aid techniques to pets who are ill or injured until professional veterinarian help can be obtained. • Admission- PWD Club Member $25.00 (The Portuguese Water Dog Club is underwriting this event for their members). (Note: be sure you have the Events list chosen and not Classes). Cancellation Policy for this seminar: To properly plan and maintain seminar dates we must have a clear idea about attendance. Cancellations with less than 5 day’s notice will not be refunded unless we can give your spot to someone on a waiting list, so please plan carefully. If you must withdraw from a seminar, a full refund will be issued to you if such withdrawal and request for refund is made directly either to the Training Director, Mindy Cox, or to the entity sponsoring the seminar, no less than 120 hours before the start of the seminar. Regardless of the reason, no-shows without notice will not be refunded. Since we maintain limited enrollment, we appreciate your cooperation to help keep our seminars small and effective for you. To properly plan and maintain event dates we must have a clear idea about attendance. Cancellations with less than 5 days’ notice will not be refunded, so please plan carefully. However, if we can give your spot to someone on a waiting list and you have informed us at least 24 hours in advance of the start of the event we will gladly refund you. If you cancel within 3-5 days of the event and nobody can take your place, a credit will be applied to your account. In either case, you must request the refund or credit by email directly either to the Training Director, Mindy Cox, or to the entity sponsoring the seminar or event, within the qualifying time period. Regardless of the reason, no-shows will not be refunded or credited. Since we maintain limited enrollment, we appreciate your cooperation to help keep our seminars small and effective for you. Some special events have different cancellation policies that will differ from and supersede this one. Please check the specific event to be sure.